Vladimir Putin used his annual state of the nation address to boast that Russia has developed “invincible” nuclear weapons that can “reach anywhere in the world.” Speaking in Moscow 17 days before an election that he’s expected to win convincingly, the Russian president on Thursday unveiled a weapon that he said could not be stopped by the U.S. missile defense shield in Europe and Asia. 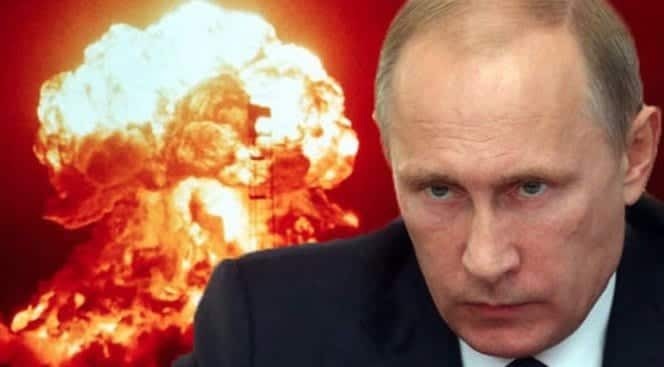 According to the BBC, he described the warhead as “a low-flying, difficult-to-spot cruise missile with a nuclear payload with a practically unlimited range and an unpredictable flight path, which can bypass lines of interception and is invincible in the face of all existing and future systems of both missile defense and air defense.” Putin went on to say that he would regard a nuclear attack on any of its allies as a nuclear attack on Russia itself, adding: “We would consider any use of nuclear weapons against Russia or its allies to be a nuclear attack on our country. The response would be immediate.” Elsewhere in his speech, Putin pledged to halve poverty in Russia over the next six years, and said the country has to double the amount it spends on infrastructure. This entry was posted on March 1st 2018 at 9:28am/09:28 and is filed under Live News Column 2, Politics, World News. You can follow any responses to this entry through the RSS 2.0 feed.